Warm evenings are perfect for relaxing outside, and our fave way to do this is by inviting over the crew and throwing an epic backyard movie night! In true #PlayMoreAdultLess fashion, we decided to outline all the ways to make your backyard movie sooo flippin’ extra (and oh so memorable). We could’ve started with the basics (how does one set up a backyard movie night? ), but the snacks and sweet treats are basically the best part so we figured we’d start there. There are tons of tasty treats that you can serve during your movie night, and do you want to know the best part? Fizzy flipflop cans pair flippin’ perfectly with every single one of the options below! There are SO many fan-flippin’-tastic ways to create a gourmet (yes, we’re getting bougie over here) s’more! The world is literally your graham cracker! Obviously you’ll need the usual marshmallows, chocolate, and graham crackers….The basics, but there are so many other toppings that you can add to the mix! Looking for pairing recommendations? 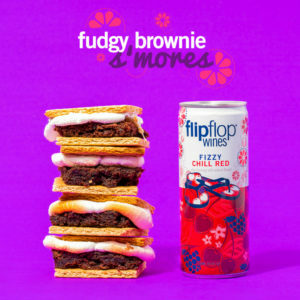 We’ve got you covered with s’more and flipflop pairings! It is an absolute waste of time to drag your TV outside for a movie night. Why? Someone’s limb will 100% always be in the way of someone’s view, you will be uncomfortably close to that one guy who either needed to shower or brush his teeth before coming over, and it will feel like watching a movie from a screen built into the seat of an airplane. Go big or go home and rent (call your public library) or buy a projector to screen your movie! If you have a white or beige wall in your backyard you won’t even need a screen to project on! Make sure you have all the pieces in place (speakers???) before the night of so that everything goes smoothly. Lay out as many cushions (or yoga mats), pillows, and blankets as possible so that your friends feel at home. Make sure there are enough lawn chairs as a “back row” so that nobody goes home with a kink in their neck! Set the mood…Seriously though, hang up some string lights so that nobody gets stepped on during someone’s bathroom run (at the best part, of course)! How many times has your bud asked you to go to the movies and then offered up literally THE WORST movie in theaters? Yeah…don’t be that guy! In an effort to get guests to R.S.V.P. (for once), make their “yes” be a vote for the movie of choice!